Immune System Description | Your Guide to Healthy Living! The human Immune System is one of the body’s most important survival tools that protects you against environmental threats. When your Immune System does not function properly you can easily catch colds have chronic infections, get inflammatory diseases, suffer from autoimmune ailments, and even get cancer. The best supplements that work for the human Immune System supplements your diet with the vitamins and minerals that help boost your immunity against harmful organisms and viruses. Our immunity is essential to avoid illness and stay healthy. Your diet alone could easily fall short in the supplying the immune health nutrients required to function at peak levels. The Immune System description below assists you to understand how the Immune System works. This should be beneficial in making more informed better choices regarding Immunity Health supplements. Although the Lymphatic and Immune Systems are closely associated body systems, they are not the same human body system and work separately. They do share numerous organs and physical functions. The Lymphatic System is responsible for immunity, fluid balance and lipid absorption. On the other hand, the Immune System provides long term immunity and defend against foreign unwanted organisms. Another distinction is that the Immune System is more closely associated with the Endocrine and Nervous systems, while the Lymphatic System with the Cardiovascular System. The role, main functions and main organs of the human Immune System are discussed below. The Immune System protects your body against harmful organisms and provides long term immunity against specific diseases. This system is the body’s natural defense against bacterial and viral invasions. It keeps these invaders out of the body and destroy those that managed to get in. These invader organisms that’s requires immune protection include, bacteria, infectious viruses, fungi, parasites and protists (e.g. algae) to name a few. Innate Immune Function – Genetic Immunity: The body’s natural immunity is built-in immune responses present at birth and is not learned or adapted. This type of immunity protects you from when you were born until you die. Active Immunity is when the body produces antibodies (B-cells) to counteract a specific antigen which is the foreign substances that results in immune response). Both fighting an infection (natural) or getting an vaccination (acquired) can activate the production of antibodies. Passive Immunity is “borrowed” short-lived immunity that may last a couple of weeks or months. In contrast to active immunity, passive immunity doesn’t need the production of antibodies. The antibodies are introduced naturally (during pregnancy and breast feeding) or artificially by vaccination (acquired). 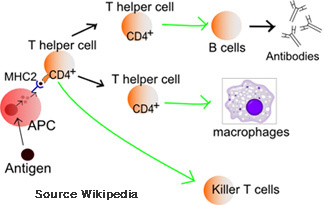 An illustration of how the Adaptive Immune System works is show in the Diagram. The Adaptive Immune System produces special white blood cells referred to as Lymphocytes cells to patrol your body organs and tissues fighting Antigens (Antigen-presenting cells (APCs) invaders). Antigens are toxin to the human body and initiates an immune response. Pathogens are bacterium, viruses, or other microorganisms that can cause disease. The Immune System consists network of cells, organs and tissues to protect the body. The main organs that the Immune System shared are Lymphoid Organs, Thymus Gland Spleen Lymph Nodes and Lymphatic Tissue. The best human Immune System supplements that work are based on user reviews and Immune Health Supplements will be continually updated. Please submit supplement recommendations that works for you for Immunity Health by completing the form below.